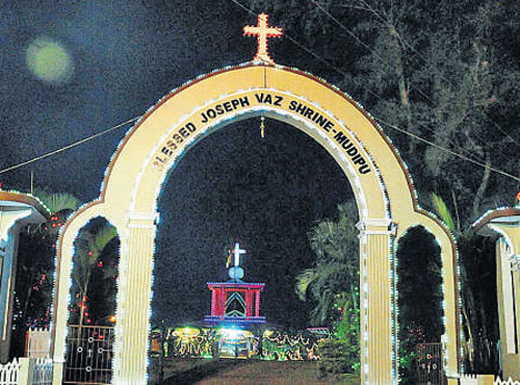 Mangaluru, Dec 07, 2017: The three-day annual feast of St Joseph Vaz shrine at Mudipu in not far from the city, gets underway today, December 7. The theme of the feast is ’let us become the witnesses of the word of God through the inspiration of St Joseph Vaz’. Solemn festal mass will be held on all days with Rev Onil DSouza of St Antony Institutions, Bishop Rev Aloysius Paul D’Souza, Mangalore Diocese and Rev Henry Sequeira, chancellor, Mangalore Diocese as the main celebrants on the 3 days. Today Dec 7, Thursday will be observed as day of sick and suffering, Dec 8, Friday and Dec 9, Saturday respectively will be observed as the feast days. Tridum was held for three-days from December 4. A solemn procession was taken out from Mudipu church to the shrine on December 3 in connection with the annual feast and adoration prayers held that days. Mass feeding has been arranged for all pilgrims on all days of the feast, Rev Benjamin Pinto, parish priest and shrine director, said. Incidentally, blessed Joseph Vaz, of Goa, was elevated to sainthood January 14, 2015. He worked in the Kanara coastal area before going to Cylon (now Sri Lanka). Pope Francis on January 14, 2015 had raised Blessed Joseph Vaz who performed miracles on the hill of Mudipu, to the altar of sainthood in Sri Lanka and a three-day celebration was held at the Shrine. Joseph Vaz was born on April 21, 1651, in Benaulim, Goa. He was the third son of Christopher Vaz and Miranda. He became a priest in 1676 and served in different parishes of Goa till 1681. Later, he was sent to Canara. Fr Joseph Vaz travelled from Goa barefoot. He served in Honnavar, Basrur, Kundapur, Gangolli, Mulki, Mangaluru and Panir. He was miraculously saved from an attempt on his life in 1684, while serving as parish priest of Panir Church.